Kimberly and Beau surrounded by some of the many awards Kimberly has won over the years. Kimberly and Beau Harding were recently approved for their own RE/MAX franchise. They are very excited to introduce their new name, RE/MAX Synergy. Formally known as The Kimberly Harding Group, not everyone who applies for a franchise is approved and the process is very strict. Achieving this milestone is very special and well deserved. Selling and purchasing a home can be stressful for current and prospective homeowners. The Kimberly Harding Group’s track record proves they have the market expertise to close the deal for you with professionalism and timeliness. With the support of dedicated, experienced, full-time office employees, you can rest assured that no transaction or client need goes unattended. Kimberly and Beau review a new listing. Over the years, Kimberly has acquired a wonderful, competent staff to assist her. Beau, Kimberly’s husband of 24 years and former ICU RN at Clear Lake Regional Hospital, joined the business 4 years ago, and has been an indispensable asset to the Kimberly Harding Group and RE/MAX Synergy’s launch. Kimberly says, “I am where I am today because of Beau and his expertise.” While Kimberly lists and shows homes, Beau wears several hats at the office acting as COO and growing the team through business development while taking care of everyday business details. They each have their own strengths with what they do, and can handle your home buying or selling experience with ease and efficiency. 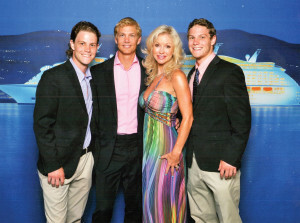 The Harding family on a recent cruise. Kimberly and Beau are both natives to the Bay Area and League City. Growing up and going to schools in the area gives them a unique understanding of the neighborhoods, subdivisions, home values and a general knowledge of where that special home you need and want can be found. Having raised their twin boys, Taylor and Tyler, now students at Texas Tech, in the area, gives them a special affection for the Bay Area. Through the years they have watched it grow and develop into a great place to live for families and individuals from every walk of life and profession. Beau and sons Taylor and Tyler on the family boat. The Harding family loves the outdoors and enjoys fishing and hunting together. Living near the bay gives them a chance to get out on the water every time they can. Kimberly loves to fish and is a member of an all women’s fishing group. 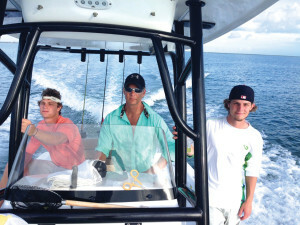 They fish in 2 to 3 tournaments a year in Pensacola, South Padre Island and Galveston. Kimberly has received many awards over the years such as the RE/MAX Lifetime Achievement, RE/MAX Hall of Fame, RE/MAX Diamond Club, HAR 20 under 40 Rising Star, Houston Business Journal Top 25, and Best of the Bay Realtor 2011, 2012, 2013, 2014. She is also a Zillow Premier Agent and Trulia VIP. Beau and Kimberly believe in giving back to their community and actively support the Children’s Miracle Network Hospitals, the Texas Sentinels Foundation, the American Heart Association and Breast Cancer Awareness. 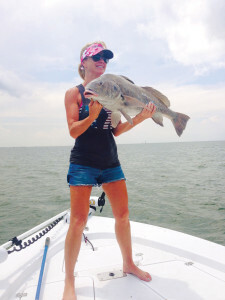 Kimberly wins “catch of the day” with this big drum! The Kimberly Harding Group considers every client important and wants to list or help you find a home regardless of size or price. Their team gives as much attention to the first-time home buyer as they do the client looking for the best appointed waterfront estate. Providing dedicated and special attention to each client, regardless of price range, is why the Kimberly Harding Group’s success has blossomed into the RE/MAX Synergy franchise. Contact RE/MAX Synergy at 281-554-SOLD (7653) or go by the sales office, 1108 Gulf Freeway South, Suite 210 in League City. Visit these websites to view more information and homes available for sale: www.kimberlyharding.com and team@kimberlyharding.com. Congrats to your success!! I love following you guys. Much love! !